← Oh, blog. I’ve been neglecting you. Here’s a web page I whipped up to help WWU Dressage riders (especially those new to the program, but it doesn’t hurt returning students to do a quick review!) 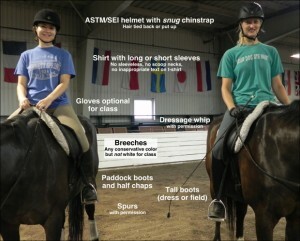 know the appropriate attire for applied riding classes. I’ll do a separate web page for clinic and show attire. That’ll come later, however.